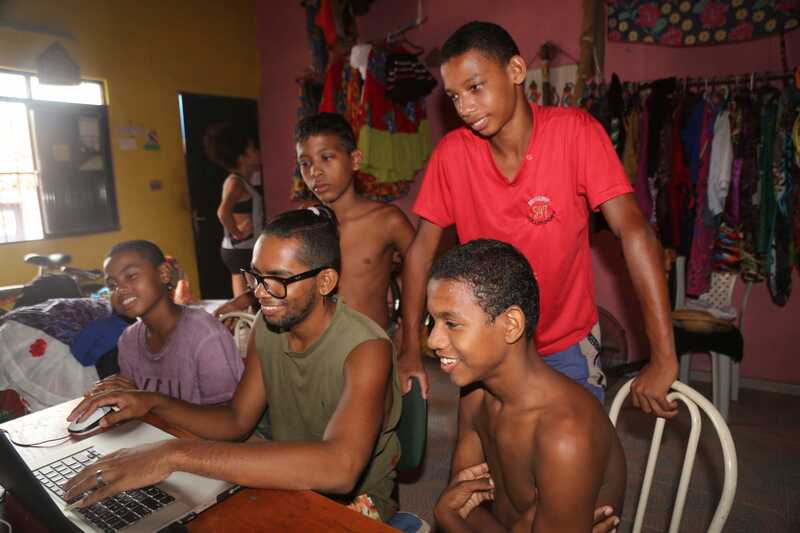 In the small Afro-Indigenous community of Cabelo Seco, Marabá City in Brazil – once known as a ‘no-go favela’ – an arts-as-transformation project in the Amazon is addressing the survival of both the community and our planet’s most precious and vital natural habitat. For our FutureLeagues series, we’ve been getting to know creative collectives who work together to address social challenges. 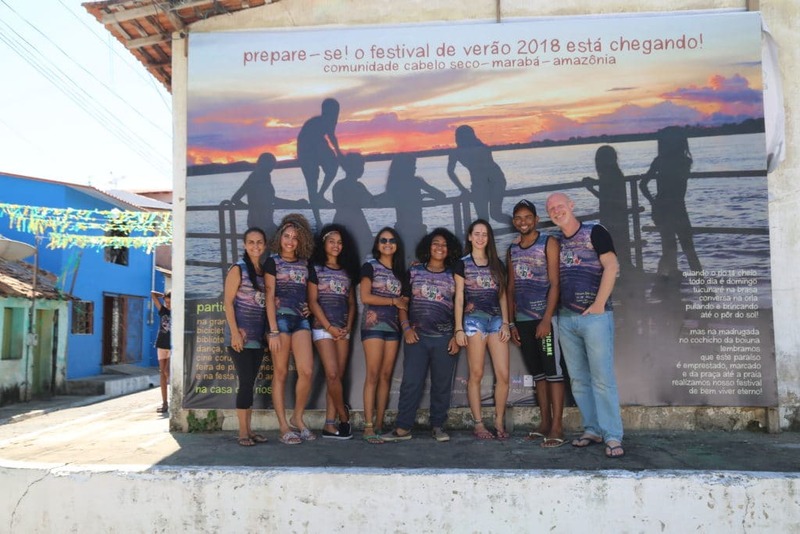 Co-founded by eco-cultural activist Dan Baron Cohen, his partner Manoela Souza and the people of Cabelo Seco, Rios de Encontro (Rivers of Meeting) uses Afro-contemporary dance, musical and percussion performance, video production, festivals and medicinal garden projects to nurture Amazonian community culture. The Rios de Encontro cultural cooperatives – like Owl Community Cinema, the Leaves of Life community library and their many public festivals and performances – are now part of the physical and emotional spaces of Cabelo Seco. Camylla, who has spent ten years in the project since day one, coordinates the afro-contemporary dance company and school. Camylla is hugely respected. She embodies an impossible dream: that a young cabocla (Afro-Indigenous) woman can emerge from a wooden home without water, toilet or fridge, sustained by little more than rice and beans, to reinvent traditional African aesthetics and create choreographies of hope. Camylla has turned herself from radical metaphor for the violation of the rivers and forests into a new symbol of a vital, autonomous, sustainable Amazon. 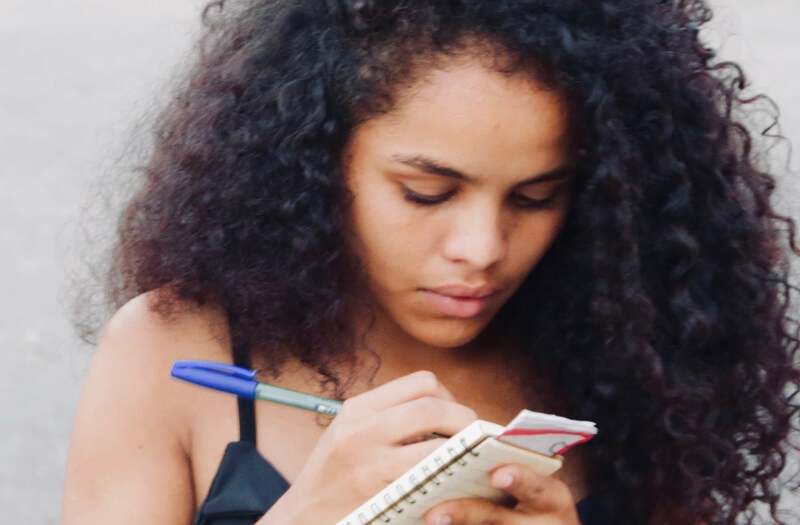 Camylla: I value the recognition as an artist and arts educator, for myself, for the project and for the Amazon, preserved through the reinvention of our Afro-Indigenous roots. The arts can transform drug-abuse into projects, and drug-wars into community cooperatives. Why dance? Because in my body there is inherited ancestral knowledge and lived community intelligence. What is the power of culture and creativity in creating a better world for all? Camylla: Culture allows us to be who we really are. By recovering and affirming our roots, we become confident, we understand and reinvent our traditions and learn how to sustain ourselves psychologically and emotionally. Using your culture, your story and your ability to create, you can make change. You can enable children and adolescents to be who they really are, through their rhythms and traditions, and you can make a difference in the lives of many people. What does the power of the collective mean to you? Camylla: Our collective allows us to grow together and inspires us to struggle further to achieve our goals. Learning to live with different perspectives, without being defensive, is part of learning the skills of collective decisions. Only by joining forces can the power of knowledge, creativity – and especially culture – guarantee our right to live as dignified human beings. What gives you the most sense of accomplishment in the project? 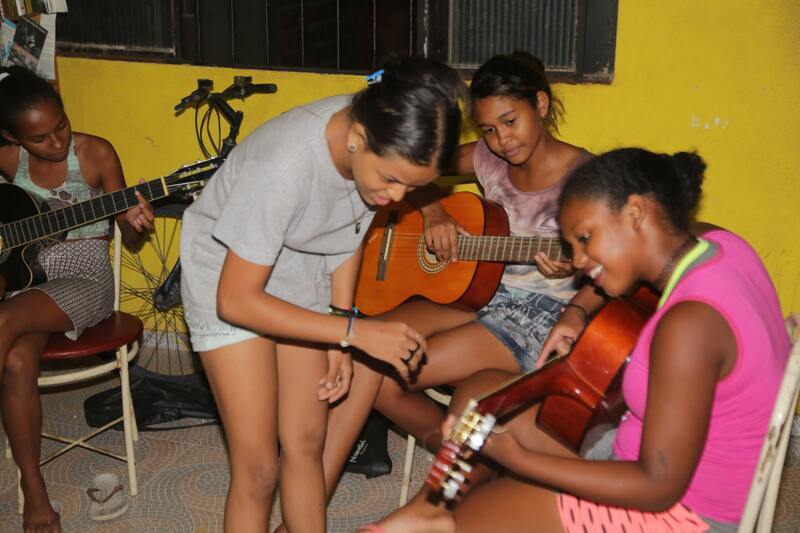 Camylla: Seeing the results from our collective taking children through guitar, dance, percussion and making theatre, gives me a deep sense of accomplishment. We have made leisure possible. For most, it’s impossible to leave the neighbourhood, but through the project, they can relax and watch great films Our Leaves of Life library gives everyone the right to be able to read and write. It brings books to children, youth and adults, door to door, every week, to ensure that they can turn their speech into words – and share their knowledge. I am very proud of helping change the lives of many people. Rerivaldo coordinates the audio-visual collective, community cinema and solar-powered bike-radio. 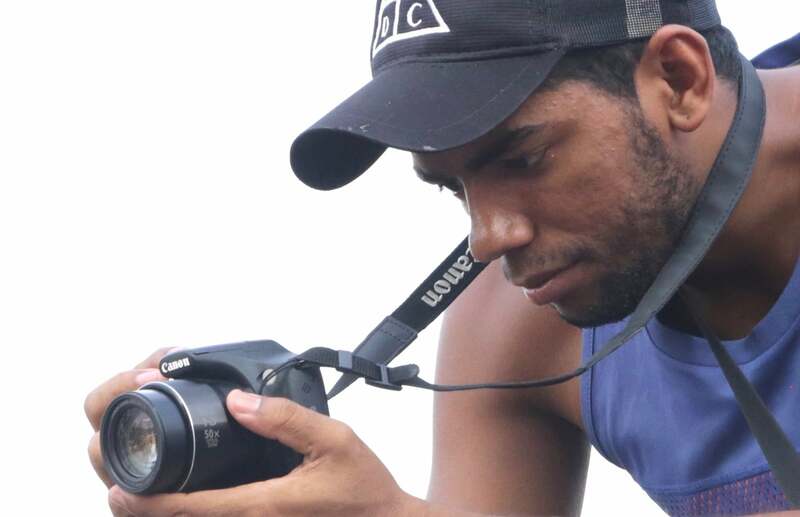 He has spent seven years in the Rios de Encontro project and says that making videos saved him from being involved scams, being caught up in trafficking – or worse. Reris is researching the future, for those who survive in the ‘red zone of development’, who read every nuance in his videos to recognise their black, poor perspective, and transform it into a secure, human future. He films and reveals what is hidden, from the ground up, to show all his community knows. He is deeply respected in the street, for his gentle, calm leadership. If he were not making videos, he would probably be dead. Rerivaldo: I’m responsible for the memory of the projects, and love seeing our children and youth watching films, flying kites and biking, as a community. I try to reveal what is hidden, from the ground up, to save our river, and all that our community knows. I don’t think we can begin to understand the transformative impact of our community library, cinema or festivals on the children and adolescents in our streets. In our everyday claustrophobic world of danger, betrayal, black and white decisions, refuge in invisibility, behind masks of expressionless silence, our project enters with colour, hope, affection, affirmation and the unexpected! Rerivaldo: I watch the effects in the eyes of our children. It changes their horizons, opens their imaginations, transforms their relationships, makes us young coordinators feel like angels, even gods. It’s a huge responsibility, raising hopes. But when I ride our solar-bike radio through the streets, it is my greatest pleasure, just confirming the week’s diary! Elisa has also been involved in the project since day one, ten years ago. As the self-confessed “shyest member of our project” the coordinator of the percussion collective, medicinal plants project and women’s rights project now performs for social justice and speaks out for gender equality. Despite being eight months pregnant, Elisa spent four hours standing, playing the drum in the collective that communicates ideas of social justice and transformation through art. Generations, genres, races and classes, were united and motivated by popular culture. But they were fascinated and inspired by Elisa’s presence and deep authority, and her powerful, silent intelligence. What gives most sense of accomplishment in the project? Elisa: It’s the gratitude that people have for us young coordinators, because we realise that together, we – the poor, black and invisible – can change the world. And we do it through art, not the boring discourse of traditional politics. What does collective power mean to you? Elisa: It means that together we are stronger and that every day we can move forward and bring more cultural knowledge to our community and schools, saving lives through recovering and reviving our roots. Elisa: The power of culture is simply incredible. It renews us with every single drum-beat, every dance-step, every lyric, and shows our people that their culture is good for the soul, for the heart, for community pride and belief in what we can imagine, and how to turn that into a better world. Without that renewal, wellbeing, proud self-confidence and creative experiment of how, our imagination is imprisoned by fear of judgement and by envy. Our Salus project (recovering backyard allotments of medicinal plants) is a good example. We have recovered our community through its cultural knowledge of traditional plants, because we believe that we can save lives by using medicinal plants and the knowledge that our people have. But we have created a new method. We go from door to door, carrying saplings, exchanging knowledge on the doorsteps between generations, rather than lecturing people about addiction to the chemical medicines. Salus now generates hope in our community, in a time of no horizon of hope. Katrine has danced with AfroMundi Company for four years. She also coordinates the Leaves of Life community library and theatre. Katrine is serious in everything she does, from African dance, to percussion, to planting traditional plant saplings, to taking her library’s books from door to door. But her unexpected talent is how she relaxes, integrates and inspires children to sit in the street and read, paint and dance. She has great patience and authority for someone so young. Katrine: I know reading and writing go far beyond the word, but just bringing books door to door, and helping people to read, changes your life. Just setting out our library in the street, and sitting with the children, teaching them to read, and then turning their ideas into drawings. I know they will use these skills to access knowledge, stand back from their own knowledge, and bring their imagination to life. I love dancing, accessing the knowledge and power of my body, and I love to share that as part of our library, so people can read their world in a different way and see their roots as beautiful and respectful. But bringing our library, the right to read and write, to every home and onto every street corner. That’s powerful and fulfilling. No corrupt politician or dictator can take that away. Manoela is co-founder of the Rios de Encontro project and institute. 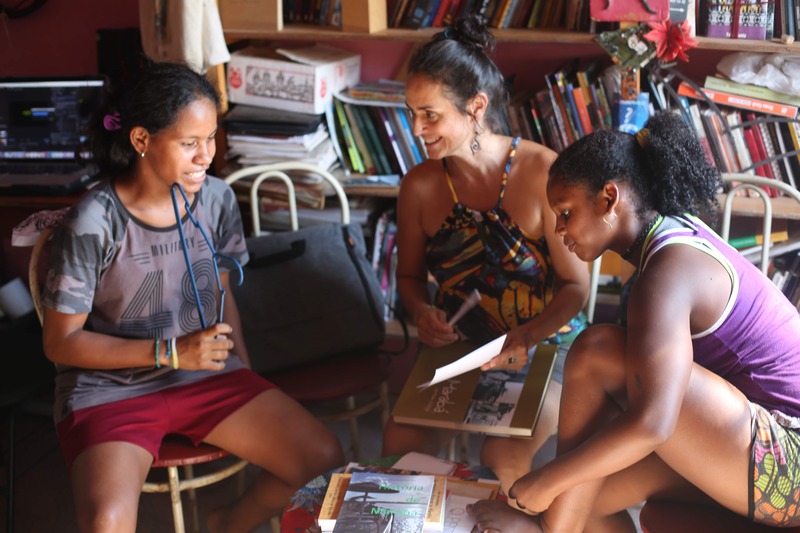 As an artist and art educator, she is responsible for the organisation, training and sustainability of the project – as a living Amazonian community cultural movement. Mano recognises the immense development of our young artists and believes arts education and community projects are key ways of sustainable social transformation. But today, she is dedicated to our new project of recovering traditional plants so that each family can take care of its everyday health, and create a community economy based on its own ecology. Manoela: It is to perceive when everything flows organically, with motivation, care and dedication, in a visible and immediate return through community action, especially when it occurs collectively, as a gear where everyone knows what he does, and does it well and with love. Each dimension is important: from when a young person who has lived ten years inside the project develops their community with bold wisdom – as well as when they might fall short, but returns to surpass expectations. Another dimension is external recognition, whether local or even international, because we live so deeply within the process that we often do not realise how much the results of realisation are there, visible and alive. That strengthens us, fuels our motivation in the face of so many challenges, encourages us to continue taking risks, creating and renewing our actions. Manoela: A collective with well-tended roots, without disputes, where differences are respected and where trust is the basis can generate the security to take risks and create the new. By generating cooperative actions, organised in an organic and participative way, the collective impacts and reverberates where it operates, whether in the project itself, in the community, or even on the planet. Manoela: Performance motivates every kind of community and inspires action, beauty and participation, to transform this world into a more caring, just and ethical community. Even with so many contemporary challenges, whether with education or the impact of the cellphone that annihilates creativity (especially of young people), boosting creativity mobilises energy and generates action, beauty and involvement – to make this world better something real and palpable. Since day one Evany has been with the collective – since she was just nine. Today she coordinates the music and medicinal plants projects and community cinema. Even as as an 8-year old, Evany’s rare musical talent and concentration were clear to everyone. What no-one expected was how quickly she became fluent in an instrument, and her reflexes to teach and share all she knows. She used this discipline to build the project’s first solar bike-radio. But she leads especially percussion and is passionate about the transformative power of the arts. Evany: Nothing gives me more pleasure than the unity and energy music creates. The synchronicity, equality and dialogue we achieve on stage, as percussionists and between the percussionists and dancers. It’s not recognition, which motivates some of us. It’s the sense of freedom, of excellence, of perfect communication, unmediated by fear, misunderstanding or doubt. Its our capacity to correct anything, unplanned, pure creativity, transforming our roots into something that has never existed. For me, our performance, is not about recovering roots, which is important. It’s our creative power, intimate and in the complete present. Evany: The ability to learn, make mistakes, trust and transform, together. Once, we were all seduced into accepting a performance fee from the Vale mining company. They destroy our rivers and forests. We recycled the fee into solidarity grants for the most disabled people in our community. That power, to transform mistakes into new initiatives, to create living examples of the right to learn, and to integrate all our creative ideas into a new cultural action, I will never forget! Watch ► Evany develops the new medicinal plants project. Photos: Photos: Transformance Photo-Archive 2018 (Rios de Encontro, 2018).